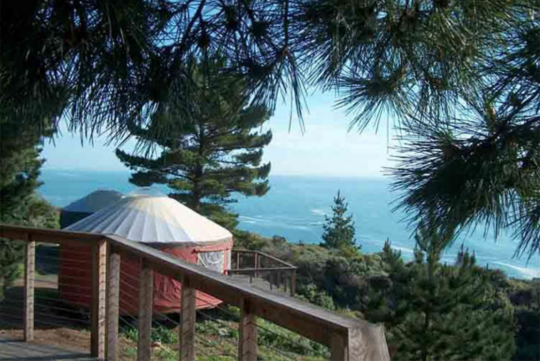 Eight years ago, I wrote a travel article for a magazine about a niche-popular but still-under-the-radar collection of Big Sur yurts overlooking the Pacific called Treebones. My wife and I had stayed there multiple times but we’d returned on the November weekend of Santa Barbara’s famous Tea Fire, when the Santa Ynez Mountains ignited like a Roman candle (not unlike this past summer’s Big Sur blaze). Despite its heated pool and excellent restaurant, Treebones was— and perhaps remains—too rustic for the California traveler who considers a Hyatt roughing it. But it feels like an ideal way to spend time in a special area that has offered respites to writers for some time. I interviewed Treebones’ owner John Handy the night after the Tea Fire began. Handy, who was also a volunteer firefighter for the Big Sur area, had once worked as a toy executive in Los Angeles before he decided to change his life and leave the city behind. We had this conversation at a picnic table near his lodge. THE BELIEVER: Are the winds always this rough here? It felt like our yurt was moving last night but it couldn’t have been moving in a dangerous way, right? JOHN HANDY: The Santa Ana winds are supposed to be following these, whatever they are, so it’ll be even more windy soon. We have winds of all kinds. It can get stronger than this, for sure. I’m guessing they were 20 mph last night when you were afraid to fall asleep for fear of blowing away. We’ve had 60 mph’s gusting up some nights, and we have some that gusted as high as 80 and knocked road-signs down. It’s not all the time, just once in a while. BLVR: Why’d you build Treebones? How’d it come about? And why here? JH: When we wanted to build this place, I was already traveling all over the world, so I was staying in hotels all the time. I wanted to do something that was unique, really different, that would really be specific to this piece of property. We had one idea in mind, which is “perching lightly.” We have that on our Web site: “perch lightly on the edge.” Because when we walked around here, on this piece of land, well, the only building that had ever been built was on the flat area down where the parking lot is, and it was a lumber mill. No one had ever built any house or anything up here, so whatever we wanted to build, we wanted to be able to stick it on the sides of the hill and put it in amongst the trees, and leave everything the way it was. 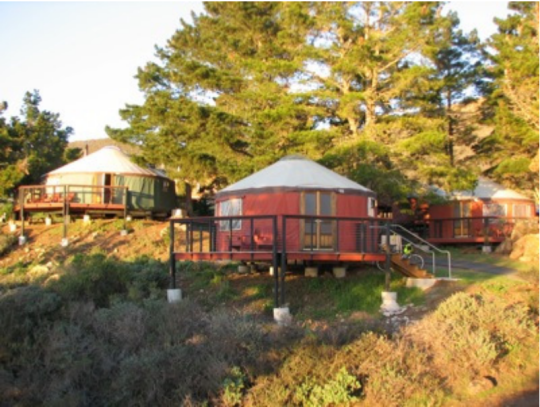 BLVR: Why yurts? What are yurts, really? 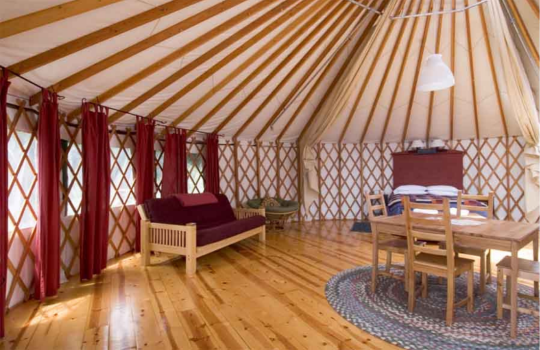 JH: Well, we were looking at tents, point-loaded structures, and all kinds of things that we could do, and my mom actually saw a yurt in Oregon at a state park. So I went and looked at it. I liked the way it was built. It was small, 14 feet in diameter. It had bunk beds and a plywood floor. But it was the inspiration for what we ended up doing. From the structure up, from the floor up, you just ordered it. They custom-made it for you, put the windows where you want them. The yurts come in a kit, and you erect them. Putting a yurt up is easy. It takes a couple days. But the foundation and the infrastructure that’s underneath it, that’s up to the people who have it. When you build on a slope like this, you have to go down to solid rock; so some of those piers were 14-feet deep. As if it was a house, not a 1,100 pound yurt. So we got 18-inch, steel reinforced piers that go down 10 or 14 feet, in some cases, into the ground. These yurts are point-loaded. It’s not a slab wall. A lot of houses have a wall. Even on the side of the hill, they’ll build a big concrete wall, and they’ll have a house on that. If it’s point-loaded, you have to have big beams that stay on points. The advantage of it on a hillside construction is that water and everything else flow over the surface; you don’t try to damn it up, you don’t put a slab on it. All the water, mud, anything else flows just right past it. There’s huge advantages to building with piers and point-loads because you can build right on the slope without trying to flatten in, and you don’t have to put the big walls in. BLVR: You’ve been open since 2004. How’d you find land on the California Coast? JH: When we were looking for land, we weren’t looking for hotel property, to tell you the truth. It was 1987, and we roamed up and down the central coast for two years. We were looking for five to 10 acres on the ocean. Because we felt like we were Coastal Dwellers. I loved living in LA, and I worked at Mattel, and I loved my job, but someday, I knew I wanted to be living here. So even though we were in our twenties, we were looking for retirement property, because we knew it wouldn’t be available at some point. We were very frustrated: we couldn’t find any quality land still available on the ocean. There were pieces, but they were in deep canyons; there was something wrong with everything. BLVR: Did you listen to him? So we go down and talk to her, and she says: “Well, there’s a piece in Big Sur that just came up.” And I said: “Wow, that seems like it’s too far away.” She said: “Too far from what?” And so we drove up here, and we saw this piece of property. It was beautiful but hard to walk around on, completely overgrown. Nothing but a goat trail. But we loved it, and we went back to the real estate agent and said that it was, like, twice as much as we could imagine affording, but that we wanted to do it. BLVR: Ok, but how’d you then become a nature hotelier? Who designed this place, and how’d people start coming? It still sounds like you took a huge risk. JH: Well, it’s weird. We went ahead and bought the land, and about a year later, the zoning all passed, and our friend (apparently now not so quiet!) said: “Sell that thing. You’re not in the hotel business.” And we said, “No, it’s our new dream. We want to build something really different, unique.” We dreamed about it for a long time. Dreaming about it was the fun part. 15 years of thinking and dreaming. We had a famous architect, Charles Moore. He even helped us with it, showed us some concepts, about how to site these things, whatever we built: How do we build on the site, where it’s sensitive to the curvature of the land, and how do we make it so it doesn’t defeat the land? He just did that for us. And we had Cal Poly students who worked on it. A whole senior class helped us with our dream, just thinking about how to do it. And then again in about 1999, we decided we would start in earnest and get going on it. It took us almost five years to get the permits, and two years to build it. But when we opened in 2004, it was supposed to be a soft opening, just gradual: people will come, we thought, and we will sort of learn how to do this. But what happened is that it exploded. There was a pent-up demand for this. We had no idea. People were looking for it. We found clients so fast. Guests started coming through the internet immediately. Just looking up Big Sur and saying: there’s something new, that’s what I’ve been looking for. So we found our guest list immediately. We were busy, filling up right away. It was quite a shock to us. BLVR: Who was this clientele that didn’t crave the Four Seasons treatment? JH: Well, what’s happening is that we have an influx of people who want to stay in something that’s simpler than a hotel room. Something with low impact. On life, the earth, etc. The whole concept of “perching lightly on the edge,” well, we want to push that point the furthest we can. For example, the Human Nest [a wooden semi-shelter sitting in a tree] is an art piece, but it’s a place that people do stay in. It’s an expression of a real nest, like what would it be like for a bird in a tree, where absolutely nothing in the tree is damaged or hurt. This is in fact made out of recycled trimmings of eucalyptus trees, so no trees were killed in the making of this nest! They actually came from Partington Ridge, where the big fire is right now. The idea is that you can be comfortable in a nest, like a bird, and be in the tree, so when the wind is like this, it’s coming right through your nest, but you’re making yourself warm, and people have fallen in love with that. It’s not for everyone, but it’s the expression of really living out on the edge, a really simple kind of structure, and being comfortable. BLVR: What do people tell you they feel like when they stay here? BLVR: You’ve gone solar. Our power went out a little last night, but it was kind of fun. Is that because of the solar stuff? How do you turn a network of yurts like this into a solar powered mini-city? I went to the solar conference about three weeks ago in San Diego to see what we could use here, if not batteries. We found the technology that allowed us to just put solar panels right into the grid that we’ve created on site with our own generators. Those things scale down when you use less power. And we’re going to be putting solar water heating panels. It’s a bit like a science project. Everything we have here is like we’ve completely gone off the grid. So, septic, water, power, everything is on-site. It’s like a small city, you’re right. The other thing is that we were one of the first commercial places in Monterey County to use the saltwater generating water, and now it’s part of the code. They really said no to us on that at first. Because they didn’t have a precedent. Nobody was doing it. You put salt water into the pool, and it converts just enough chlorine to do its trick. But at first Monterey County said no, that’s not part of our code, and we actually had to work with our pool guy and ourselves, to make a list of cities that do use it; the company that makes it had to submit some paperwork, too. And we said, “Let’s make it part of your code.” You need to force yourself to get greener. You can’t sit around and say we didn’t do it. BLVR: You had to negotiate a lot. JH: I really brow-beat Monterey County and said I’m not going to accept that. I’m doing a lot of work, I’m trying to do it the right way, and you’re going to work with me, or I’m going to make you work with me. And in the end, the director of planning had to come here for some kind of a final deal, and he came during the middle of winter at night. He wanted to talk business with me, it was supposed to be a light check, but I said before you do that, why don’t you come into the lodge for a second and check out what’s going on here. It was full of people, having dinner, having a good time, and he goes: “Wow, they’re really enjoying themselves.” He looked at some of the articles that have been written about us, and I go: “What I want you to do is… you should go back to your people, back in your office, and tell them this was successful. The process was successful. Because in the end, don’t you want you a place that the visiting public enjoys and gets good press and is good for Monterey County and everything else?” And he goes, “Yeah, that’s a good point, I never actually thought about that.” We need to celebrate the good ones. I’m sure there are plenty of ones that turn out bad and people are criticizing, but this one they’re not criticizing, they’re not saying this is a bad choice for the coastal commission or Monterey County, and that really has worked out well for us. BLVR: How’d you get into firefighting? All of this wasn’t time-consuming and physical enough? JH: When I moved to this community, I had been an executive at Mattel, and I was interested in what I could do for the community that would be most needed. They didn’t need a mayor, they didn’t need a political leader. But one of the things they needed was a volunteer fireman. I’m turning 50 in January, so I’m kind of old for that, but not for the brigade. I’m mid-range in the age of the brigade guys. And we’ve had a long history of volunteer firefighters here in Big Sur. The reason is that there’s no professional firefighting here. 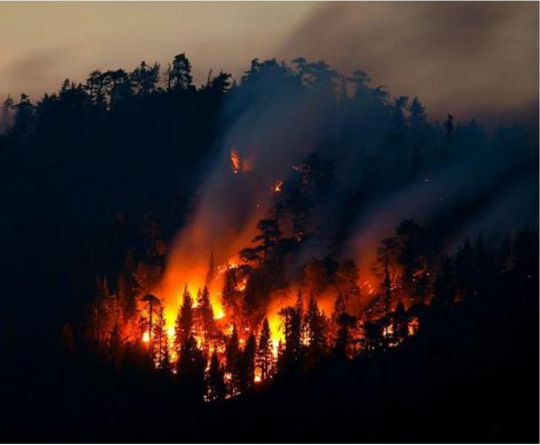 The forest has a fire group that’s north of us, but their main focus is protecting the forest. As far as structures and people’s homes go, and people who drive their cars off the cliff and need to be rescued, accidents on the road and things like that, the brigade does all of that and trains just like a regular firefighting crew. So I joined a year ago. And in that year, I’ve been on two major fires. I’ve been to multiple motorcycle accidents, car accidents. I went on a cliff rescue, where a guy fell off a cliff hiking, way off in the back country. Helicopter evacuations, all kinds of things, within that one year. It’s been one of the most trying and rewarding things possible. We have these pagers, and I have them at my house or I carry them with me if I’m walking around. It could go off any time of the day. And every time it’s different. The scariest one for me was getting this signal that said there’s a man not-breathing. I’d been to first-responder class, and I knew you have four minutes before your brain starts dying. This guy’s not breathing, and I’m sure the 911 person is giving advice to whomever’s there, but when I got to the scene, even though I was still a rookie, I was the only firefighter there and the only person who knew what was going on, and that’s a scary thing. But it’s very rewarding to be able to help, and I love it. BLVR: Were you one of those kids who always wanted to be a fireman? JH: I never dreamed about being a fireman; that wasn’t one of my things, but I’m doing it. I’m on the school board, and I work on government relations with different things that happen here in Big Sur, but it’s been fun to be a part of the community, not just a business that draws from the community, but to give back, to devote time and money to good causes. They had a huge capital campaign recently, and they bought new fire equipment for everybody, brand new fire trucks, but they only have two water tankers, all in the north coast, and nothing down here. They had no money left in the fund for another. So I bought one, that white truck down there [points into the canyon parking lot]. That’s the water tanker for the southwest. I bought it for the community and to use it for wildfires. That’s part of what I want to do. Like in the Old West days, there’s no formal government here. There’s no infrastructure in Big Sur; it’s a huge big piece of coast, but it’s all just run by the people, different committees and organizations, like the volunteer fire brigade. And so you do what you have to do to be a part of that community. And people help you as well. I remember that I drove up to the community meeting in that fire truck, and they knew I was trying to help and do that, and just spontaneous applause came my way. People got out of their cars. And if we had a problem here I just know from the nature of people, not even because I bought the fire truck, that they would all show up here and do whatever they needed to do to help us. It’s just the way it is. BLVR: Who actually built this place? Who has the time and muscles and inclination to build things anymore if they don’t work for a big company? People that live here in Big Sur, well, their needs are very simple. So if they get paid 20 bucks an hour to build something for three months, they make more money in those three months than they would make in a year or two years. They really basically say: I got enough. I don’t need to work for a while. They live off the land, and they live simply. So as a result, we had to continually hire new people, bring new people in. We factored that into our whole process. We worked with the bank. The bank had to be flexible with us too, because I told them what we were doing. They wanted to push us to finish it in one year. So it was supposed to be 18 months, it took two years, but they still hung with us. BLVR: What’s on tap for the next year’s weather? Mudslides? More fires? JH: The worst case scenario, north of us where the Basin fire was, in the valley, is that there could be road closures and mudslides. Depends on the weather. Heavy rain? You’re going to have some of that happening. CalTrans is super prepared. They’ve already hired extra equipment to stand by all winter, to keep that road open, we’re going to try to keep that road open. That’s the only artery through here. If it closes, everything in and out becomes hard. No matter what happens, we’re always going to be accessible from the south. BLVR: What happens if Highway One closes? JH: In the past, if we’ve had problems on Highway One, people still come to us by taking a little extra route. Coming from the south is not a problem. If the road did close, this is still a fun place to be. There’s so much to hike around and do right around us, and we would have less people, so… the likelihood is that there will be mudslides and some problems in the valley. That’s what everyone is preparing for. Even my kids are training to be volunteers in that situation. Too young to be in the fire brigade, my two boys are, but they’re taking certification training, and they have to study for it. Then you can go on the road and help people. They don’t want untrained people running around trying to help. So they train them, then certify them; there’s about 150 people in the community who’ve been trained on that. More than 10 percent of the community will be volunteer helpers. It’s a special thing. When you’re not living in a formal community where all that stuff is taken care of for you, everybody takes care of each other. Henry Miller told a story of being in Big Sur, one winter, in his cabin. The road closed in both directions, and there was no going in and going out, and he hadn’t prepared for it, and he watched his food supply diminish until there was nothing left. And he was sitting in his cabin one rainy night and he said, as bizarre as this can be, “I can die here. Of starvation.” Then, a knock on the door, in the middle of torrential rain. He opens the door, and a bucket of potatoes is sitting there, right at his door as some stranger walks away. And he goes: “Hold it, who are you?” And the guy goes: “Oh, I just figured you’re going to need these,” and he left. He wasn’t there to socialize or anything else. He just left the potatoes. Henry Miller said that the thing you can say about the people of Big Sur is you might not see them for months or for even years, but when you need something, they sense it and they show up. That’s what he learned about the people here, and that’s exactly what they’re like.